Today I am going to show you how to configure IPSec VPN on Cisco ASAfirewall. The process is very easy so lets get started. In my case I am going to configure Cisco 5510 Series Adaptive SecurityAppliance (ASA) using the Adaptive SecurityDevice Manager (ASDM). The remote VPN Client user authenticates against the Active Directory using a Microsoft Windows 2003 Internet Authentication Service (IAS) RADIUS server or Local User database. 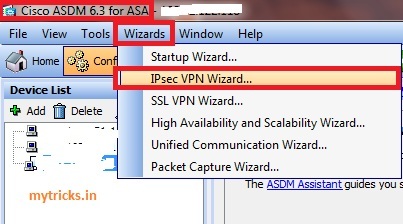 Select Wizards > VPN Wizard from the Home window. 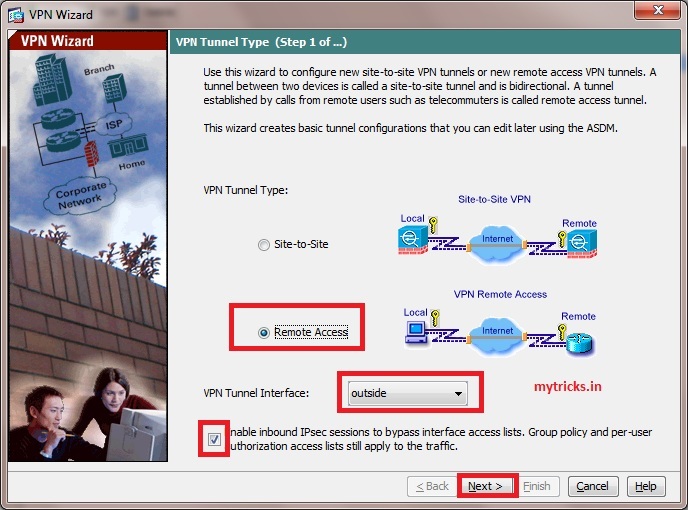 Select the Remote Access VPN tunnel type and ensure that the VPN Tunnel Interface is set as desired. Choose whether you want remote users to be authenticated to the local user database or to an external AAA server group. Here I am using my Cisco ACS Server. 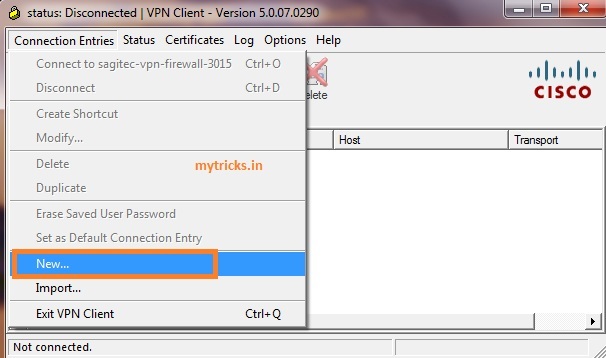 Define a pool of local addresses to be dynamically assigned to remote VPN Clients when they connect. Specify the DNS and WINS server information and a Default Domain Name to be pushed to remote VPN Clients. Specify the parameters for IKE, also known as IKE Phase 1. Configurations on both sides of the tunnel must match exactly. 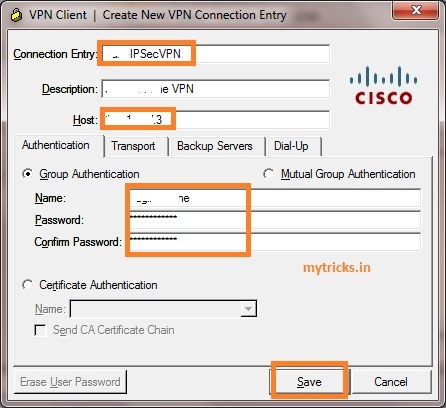 However, the Cisco VPN Client automatically selects the proper configuration for itself. Therefore, no IKE configuration is necessary on the client PC. 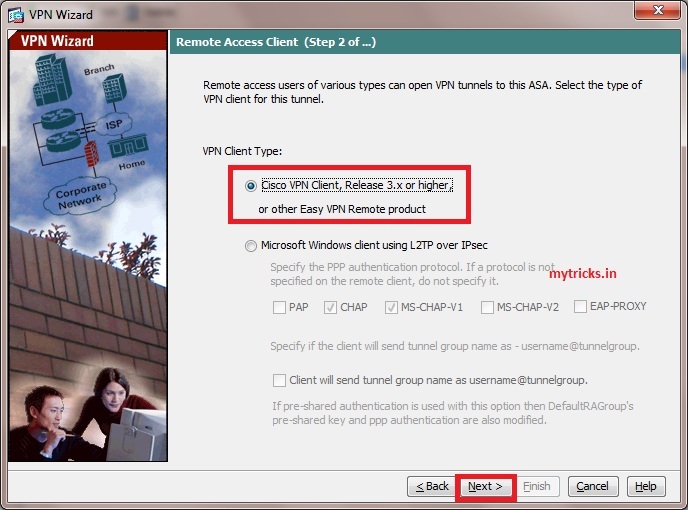 Specify which, if any, internal hosts or networks should be exposed to remote VPN users. Attempt to connect to the Cisco ASA using the Cisco VPN Client in order to verify that the ASA is successfully configured. Select Connection Entries > New. Fill in the details of your new connection. The Host field should contain the IP address or hostname of the previously configured Cisco ASA. The Group Authentication information should correspond to that used. Click Save when you are finished.